Yeah, a sandwich helped, a surprisingly good reuben from Claire’s Deli pared quite nicely with the 46 and I’m feeling much less stuffy about the distilling practices of distillers who could care less what I think about their distilling practices. Maker’s Mark has been unique in bourbon world for basically offering only one expression since their debut in the 1950’s. Sure there’s the mint julep stuff occasionally and the dipped-wax caps change color once in a while, but their excellent wheated recipe bourbon has remained unchanged, unchallenged, and readily available for so long it’s easy to forget that Maker’s is one of the originators of the small-batch trend. When a company like this announces a new addition to the line, people tend to take notice. Maker’s took a novel approach by not bottling a new recipe or simply bottling older stock, instead they came up with a unique way of finishing their well-loved whisky. They’re taking barrels of their usual stock (aged approx. 6 years), removing the whisky, removing the barrel head, affixing seared French Oak staves to the inside of the barrel, and then re-filling and re-sealing the barrel for it to age for several more months. The French Oak is much more tannic than American Oak and presumably lends a more woody, winey, spicy, dry quality to a spirit. So, there you have it…definitely innovative and definitely non-traditional, especially from a company that hasn’t budged from their successful formula for years. The Nose: Compared to the original Maker’s, there’s much more oak and grain here…that stave jumps out and whacks you lightly on the schnozola. It also seems a bit more sugared, with burnt toffee notes giving the caramel a little bitterness to keep it in check. There’s decent fruit as well, plum, red fruits, baked apple, it’s actually kind of jammy and a little reminiscent of fruit-heavy California reds. Just a bit of foreshadowing, there’s a touch of baking spice, here as well…cinnamon mostly. The Palate: A bit richer mouthfeel than the orig., honeyed, sweet entry with oak and baking spices waiting impatiently in the wings. There’s still a little baked fruit happening and some vanilla bean but mostly, the palate is dominated by increasingly big, drying oak and bright spicy cinnamon with cloves and nutmeg hot on their heels. It’s a fairly unique bourbon experience, not really alcohol hot, nor rye-spicy, just bright and very dry. The Finish: Tannic, spicy and quick…dry, dry, dry. Thoughts: Veeeeerrrrry interesting. Maker’s has definitely come up with a unique flavor profile for the 46. It obviously places an emphasis on the oak and spice, and while that predominates both the nose and palate, it’s balanced just enough by other flavors to be really enjoyable. Beneath the oak and spice, there’s still the wheated smoothness you’d expect as well more sugared notes. 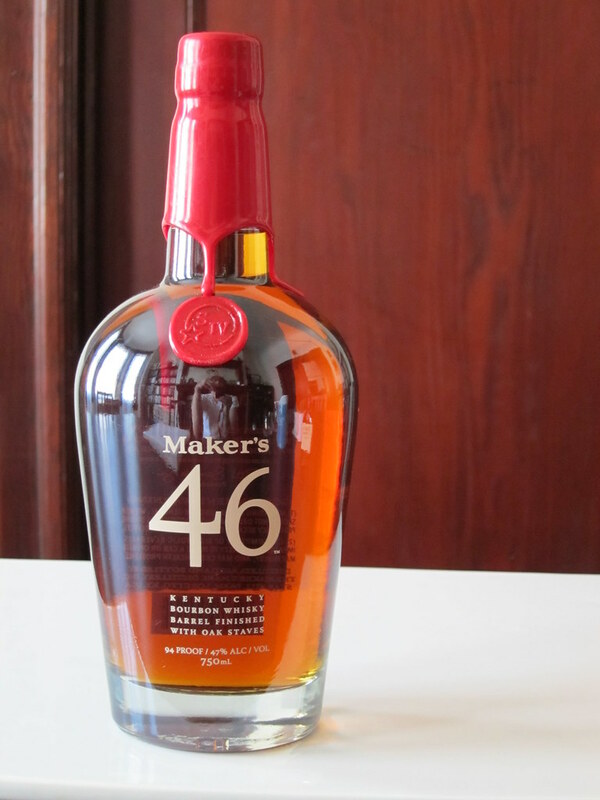 At times, it reminded me of a rye whisky but without the bitterness…perhaps Maker’s is trying to get itself into more cocktails, the flavors and presence of the 46 would certainly lend itself well to mixing. In a nutshell, I’d say the 46 is a successful and bold step for the singularly focused Maker’s. It is definitely “bigger” than it’s older brother, the wood and spice much more assertive and dominant, but some of the subtler notes of the original are buried a bit as well. Oh I’ve got to try this. A new twist on my favorite “old standby” Bourbon. I was thinking the same thing, Rol. I am glad he was using a DeWalt drill, though; you can’t trust a whiskymaker who uses cheap tools. Glad you reviewed this. I’d been wondering about it since I noticed on Healthy Spirit’s blog that they’d gotten some bottles in. So how expensive are these anyways? I picked up my bottle at D&M Wines on Fillmore for $33.99 +tax and I see that K&L has it for $31.99. After trying giving it a good try, I’d say price-wise it’s worth checking out, especially if you like Maker’s, though perhaps a little expensive. If it was in the $25 – $30 range, that would seem a better deal. The video on my website shows how the staves are attached to the inside of the barrel. Four screws hold two plastic rods on which the staves are threaded via a hole in the stave. The video is from my visit to Maker’s Mark to taste the 46 before it hit the market. How much better is this over the normal Makers? In my opinion it IS a little better than the regular Makers, but really it is just different in that the flavor is more complex. Beyond that whether you like one whiskey better than another is just a matter of taste. I think they’re both good whiskies, if you like things a little bolder and spicier, you’ll like the 46, if you prefer things a little milder and more subtle, the original Maker’s might be the way to go. The 46 is definitely worth a try in any case.